Understanding channels in Google Analytics is important. In my previous blog post 3 Things Your Analytics is Trying to Tell You, I talked about how a channel can be generating leads but not converting. Now I’m going to show you if a channel falls between being the first point of contact and the final closer in the buying process. 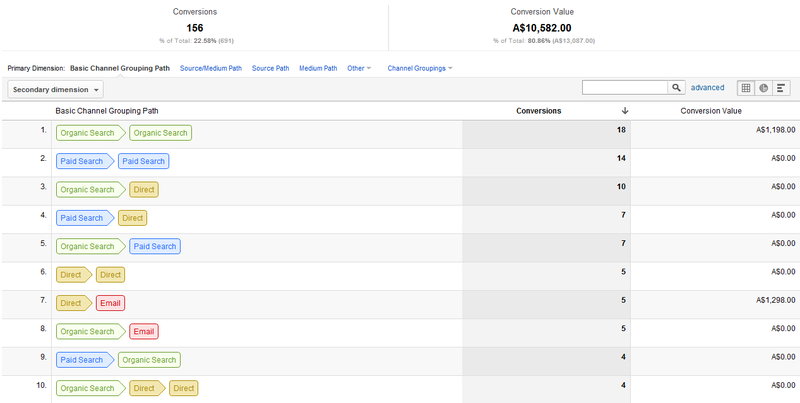 Once again you have to dive into your Google Analytics: go to Multi-channel Funnels ->Top Conversion Paths. Filter the results by the channels you want to check. Let’s say you want to see how your email campaigns are performing. Looks like the email campaign is not performing so well. Or is it? This data tells you that your email campaign actually contributed to 7 conversions closed through other channels. The beauty of this method is you can use it on every channel that brings traffic to your website. For example, you might discover that Paid Search appears often in the middle of your customers’ buying cycles, though it is hardly ever the final channel that results in a purchase. In this scenario, you’d know that you shouldn’t decrease your paid marketing spend based solely on final channel data. With proficiency in Google Analytics, the possibilities are endless to hone your online marketing channels to perform at their peak potential!